The Easter holidays are nearly upon us and it is definitely time for a well-earned break and also a good excuse to indulge in too much chocolate. If you’re thinking about a luxury glamping break in Devon with us here are some highlights of what is happening locally so you can hatch a plan! If you love cheese then you may be interested in the tasting session happening at Quickes farm on Saturday 13 April, featuring many award-winning clothbound cheeses, alongside other selected cheeses from the region. The gin trend continues and what better way to sample all the different types and flavours than at the best of Devon gin festival in Exeter on Friday 19 April. Local brewery, Hanlon’s have recently expanded their on-site restaurant so you can enjoy some locally sourced, farm to plate, rustic comfort food in a cosy setting, overlooking the working brewery while drinking some of their multi-award winning egg-ceptional ale. There are numerous countryside walks in mid-Devon so you can get close to nature and be amazed by the beautiful scenery of the rolling Devon hills. You could find giant moths at the marvellous moth themed trail at National Trust Knightshayes, have a stroll along the Grand Western Canal or take a trip on a horse-drawn barge. You may be shell-shocked at the Canonteign Falls, England’s highest man made waterfall set in ancient woodland and beautiful lakes. For any Peter Rabbit fans a trip to Crealy is a must as you can meet the bunny in person and if you’re not too chicken can enjoy water rides, roller coasters and indoor adventures. Quince Honey Farm have just moved to a brand new location and the all-weather attraction offers beautifully landscaped Nectar Gardens, ‘Products of the Hive’ exhibition, the Bee Shed hosting beekeeping demos and not forgetting the ‘Play hive adventure park’. Just next door to us you can hop on a train ride at Devon Railway Centre, explore the indoor play coaches and get interactive with the model railway. 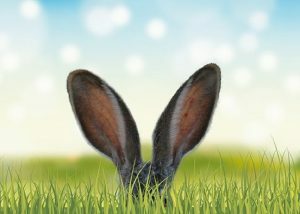 We’re also hosting our very own Valleyside Escapes Easter egg hunt – it is going to be a cracking Easter!